Welcome to the website we have created to share the story so far of the Jamaica Wales Alliance / Dolen Jamaica-Cymru. Nov 2018 Update - with apologies for it being slow to update with photos! 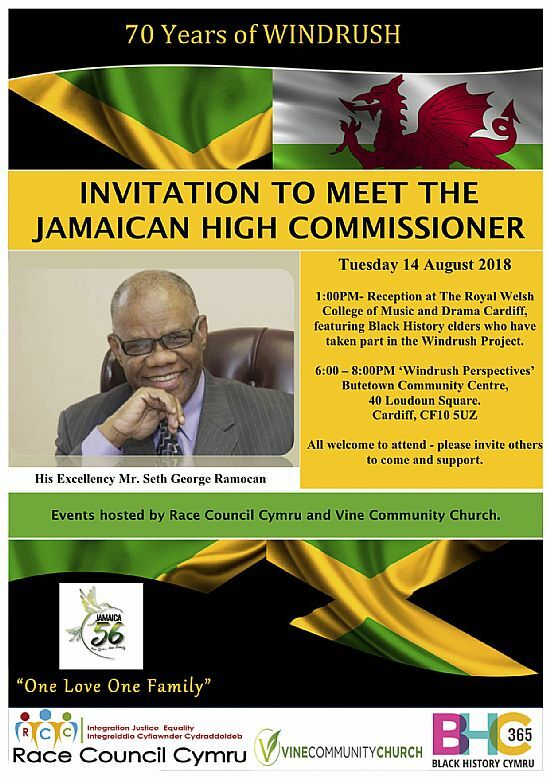 The Jamaican High Commissioner, His Excellency Seth George Ramocan, his wife Dr Lola Ramocan and the Community Relations Officer at the JHC, Mrs Vivienne Siva, undertook a 3 day tour of Wales starting in Cardiff on 14th August, before travelling up to North Wales on Wed 15th Aug to attend a welcome at Bangor University, a visit to Penrhyn Caste and a Civic Reception hosted by the Mayor of Bangor. The highlight of the day on Thursday 16th August was a visit to the Denbigh Show. We have also made great progress in the development of links between the City of Bangor and May Pen, Clarendon. See News. The Jamaica Welsh Alliance was created when a small delegation from Wales was invited to Jamaica by Jamaican poet, Yasus Afari, in September 2016 to explore the creation of sustainable links between the two countries. Yasus Afari has visited Wales many times to help develop and support Black History Month activities.He has performed with Richard Douglass Pennant, who is also a poet. Yasus Afari arranged meetings with the Jamaican Commission for Cultural Development and the Institute of Jamaica which got the delegation's programme off to a flying start and the week of visits, poetry events and consultation ended in a Reception hosted at the British High Commission in Kingston. 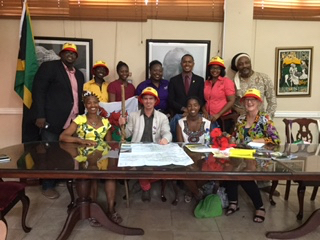 Members of the Welsh delegation at the Jamaican Commission for Cultural Development. Jonathan Greenland has agreed to facilitate the development of the Jamaican Wales Alliance. Jonathan is Welsh and now living and working as Director of the Museum of Jamaica. Liz Millman, CEO of Learning Links International, will manage the first steps to support the set up of links. Please check through the various tabs to check out the potential links and other information and ideas. We will be setting up a facebook page, but please feel free to contact the Jamaica Wales Alliance through the Contact Us page. NB Currently we don't have funds or plans to translate the site into either Jamaican or Welsh, so we'll be using English, the language that the English introduced to both countries as it is the common language we have between the countries of Jamaica and Wales. However as there was a Japanese / Jamaican Dictionary published a few years ago, perhaps a Jamaican / Welsh dictionary could be a project for the future!